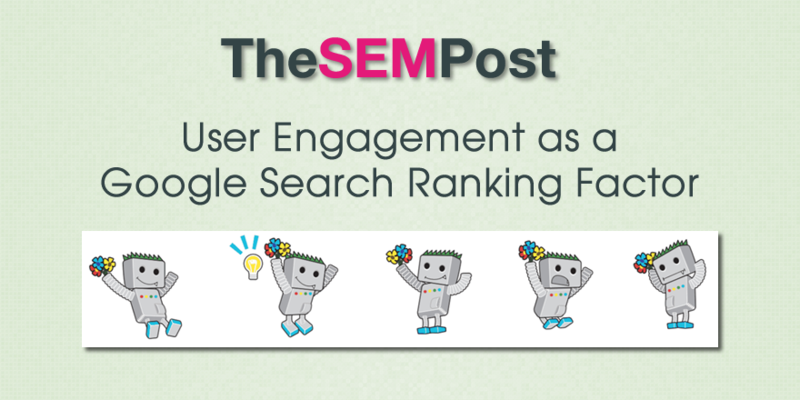 The possibility of user engagement as a ranking factor is something that has been getting some traction amongst SEOs lately. Despite both John Mueller and Gary Ullyes saying things like CTR and Google Analytics don’t have any impact on rankings, other than to test updated ranking signals, many people still believe otherwise. The question came up about user engagement as a ranking factor in today’s Google Webmaster Hangout with John Mueller today. User engagement data as a ranking factor is a rising topic. How can it can be a reliable ranking factor if there are different types of search purposes? e. g. on an airline site: customers who want to see news about a strike vs customers that want to book. That’s a good question. And I don’t think we have said that we use it as a ranking factor. So from that point of view, that is something to ask those that kind of are rooting for this as a ranking factor. We do take into account how people react to the search results when we refine our algorithms, so that is on a very broad scale where we say over all of the billions of searches that we see, implementing this algorithm or showing this in search has resulted in this kind of a change on the user behavior. But doing that on a per URL basis is really hard because I can mention that there’s things like intents, people searching for the same thing but trying to find something completely different. People who just want very brief news blurb on a specific topic or those who want to find something that they can sit down and read for a couple of hours. So they are very different intents and combing them makes for a really, really noisy signal and I don’t think that would make sense there. It is an interesting comment. Gary Illyes has previously said at SMX Advanced that clicks are a very noisy signal and one that isn’t that useful. But while it is implied by Mueller’s response that user engagement is not a factor, he doesn’t come right out and say it, but rather infers to the fact he doesn’t believe they have said it is used a ranking factor. That said, regardless of how you see John’s statement on user engagement, it is something that is very worthwhile for website owners to look at even if it does have zero to do with rankings. If you see a high bounce rate on some pages, it is a sign you should improve the quality or try and meet the searcher’s needs on that page better. Likewise, if you see many people heading straight for the search box on the site, it is a sign that maybe you should look at navagation and make it better. There is a lot of value in user engagement, especially if you are tracking paths, conversions or other metrics useful for your site. I don’t think I’d be wrong in saying that comments can really help a site. When Google crawls the page and sees new content and new discussions, it might cause the crawl rate to increase, and they do pick up, to a smaller scale, what’s said. I think Google is making a lot of decisions about a site overall before they put a particular page at #1. Domain authority improves with how users visit other pages. Bounce rate and popularity of other pages can both indicate user engagement. In other words, maybe there is no particular “user engagement” factor. But the kind of things they’ve chosen to track, suggest that they care about it. Ranking signal or not ranking signal, it doesn’t matter. Everybody should focus on his users and optimize for them. Or does it hurt when a user stays longer, reads more and buys a lot more products?